”Private Butler, call my wife and tell her because of a tool you lost in a plane, I’ve been in a horrible Helicopter accident and that's all we know right now.” That's what my Sergeant told me to do after finding a pen that was mine in one of the helicopters I used to work on in the Marine Corps. Back when I was a young avionics tech in the Marine Corps working on the the CH-46E, VH-3D and the VH-60 which a lot of you may know as “Marine One”. I was always eager to learn and work on these beautiful aircraft; I was ecstatic to support an awesome mission. I learned a lesson very early that has stuck with me from that day moving forward. I was working in the “Flight Control Closet” and my pen ,which had my last name on it, fell out of my pocket and was left in the plane after a job I was working on. (I DID NOT KNOW THIS!) The next day the sergeant ,that would sign out my tools, had asked to use my pen. All the while knowing I left my labled pen in an aircraft because he was the one that found it. After searching for my labled pen that I realized was missing, I realized what my sergeant was up to. He began to instill in me what some may call “Discipline.” It was his way of teaching me that tool control was very important. He made me the Tool Control Representative for our shop, which consisted of etching all tools, replacing tools, silhouetting tools, building out new tool boxes and inspections. Anything tool related, I had to handle it, and on top of all of that he made me call his wife and tell her I was responsible for causing a helicopter crash that her husband (My Sergeant) was involved in. This was his way of putting the importance of tool control into perspective. From that day I learned that anything from a pen to a screw to a drill should always be accounted for prior to leaving the plane you are working on because something as small as a pen can cause a plane to go down and that is something none of us want to be held responsible for. I never forgot that feeling of making that phone call though. That was over 7 years ago and it is still etched into my brain years later. 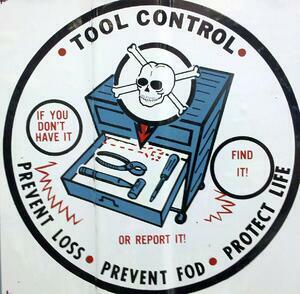 Thankfully, each organization out there has some sort of Tool Control Method, some more strict than others but nonetheless, Tool Control directly correlates to Safety and your safety is #1 in aviation. Moral of the story is, when it comes to aviation whether that’s Military, Manufacturing or in General Aviation don’t rush, don’t make shortcuts. Work efficiently but don't cut corners. (Even if it means having to tell a customer their plane might be a day or two late). At the end of the day, your safety is what matters the most to us, the Mechanics and Avionics Techs of Sparkchasers.